I was given a copy of this book from Chick Lit Plus in exchange for an honest review. So where is Louise’s mother? Will Emma ever be free of her ex? Both women frantically search for answers, but when the truth finally emerges it is more shattering than they had ever expected. 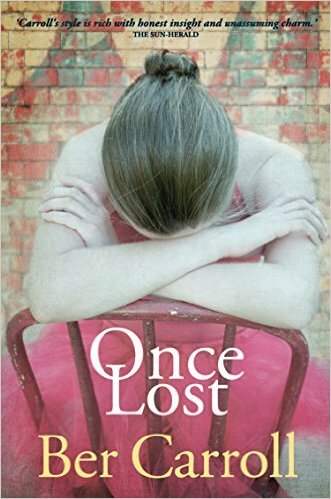 “Once Lost” had me at hello! Now, I need to read all of Ber Carroll’s books!!! Ber delivers a wonderful literary menu: Best Friends. Dublin, Ireland. Women’s Fiction. Women’s Dilemma’s. Turmoil from the past. Friendships. Motherhood. Romance. Travel. It had everything I love and more. An intricately written story that will have you flipping the pages until you are finished. Louise moves from her home; Dublin, Ireland and travels the world for her business, which is conserving art work. As a Conservator she can spend months, even years working on one piece of art work. Louise has to “go to the art”, so she has spent time in places like New York and London, to name a few. At the beginning of this story she is searching for a place to call home in Sydney, Australia…thousands of miles from her home in Dublin, Ireland…and her Best Friend, Emma. I loved getting to know Louise. She was just an awesome character. Her mother abandoned her when she was 8 years old. All she had was her Step-Father, and her best friend, Emma next door. Emma is still in Dublin and she is missing Louise something fierce. Emma has a daughter named Isla, from a previous relationship with a man named Jamie. He is a terrible father figure, but the courts say that Isla must see her father. Emma spends most of her time worrying about Jamie, and trying to take proper care of her child. She now lives with Eddie, and he is a fabulous character in this book, as well. I loved bouncing back between characters and countries. I loved being in Dublin most, but I am biased as I lived there when I was younger. Thank you! I appreciate the opportunity to review Ber Carroll’s book.